Sun, Apr 7, 2019, 10:33 pm SL Time, ColomboPage News Desk, Sri Lanka. Apr 07, Colombo: Sri Lanka President Maithripala Sirisena emphasized that people in the society should not be divided according to the language they are speaking. Addressing a function held at the Bandaranaike Memorial International Conference Hall this afternoon for the launch of the simple Sinhala translation of the Holy Quran, the President said that all politicians regardless of their political party should be held responsible for the division among the people of the country. It is of significance that the translation of the Holy Quran has been made in the simple Sinhala language, in order for the other communities to get an understanding of the history of Islam, as well as the culture and religious background of the Muslim people. The work was carried out by the All Ceylon Islamic Religious Association, based on the views of Islamic scholars. Speaking further on the occasion, the President said that in the process of building national reconciliation the division of the society according to the spoken language has become a severe hindrance. Emphasizing that this division should be ended by the understanding and mutual trust between all the races and religion, the President said translating the Holy Quran in to simple Sinhala is a significant junction in creating national unity and reconciliation in the country. Pointing out that similarly, classification of schools by language also should be ended, the President said it is of utmost importance to expand the trilingual national school project built at Polonnaruwa on a concept of his to other areas of the country as well. 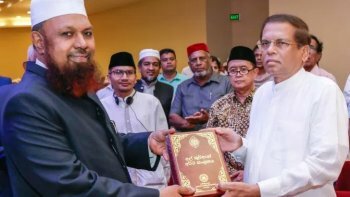 The President of the All Ceylon Jamiyyathul Ulama Ash Sheikh Mufthi Rizwe presented the first copy of the Holy Al-Quran translated into Sinhala to the President. Islamic religious leaders, former Minister Attorney-at-Law Imthiaz Bakeer Markar, President's Counsel Faizer Mustapha, Secretary of the All Ceylon Jamiyyathul Ulama MMA Mubarak and his members were also present at the event.